ASU students and collaborated to build Apportion. After a year of test runs and fine-tuning the sleek vehicle, Team Sunergy celebrated a third-place finish among 15 contestants in the 2016 Formula Sun Grand Prix. Pity the souped-up DeLorean from the Back to the Future movies: A group of Appalachian State University students is helping to build the car of a real-life future, and it looks a lot cooler than “Doc” Brown’s fictional ride. The students, their faculty advisors, and corporate partners are leveraging advances in renewable energy to create and perfect a solar-powered vehicle that could provide sustainable, eco-friendly transportation. 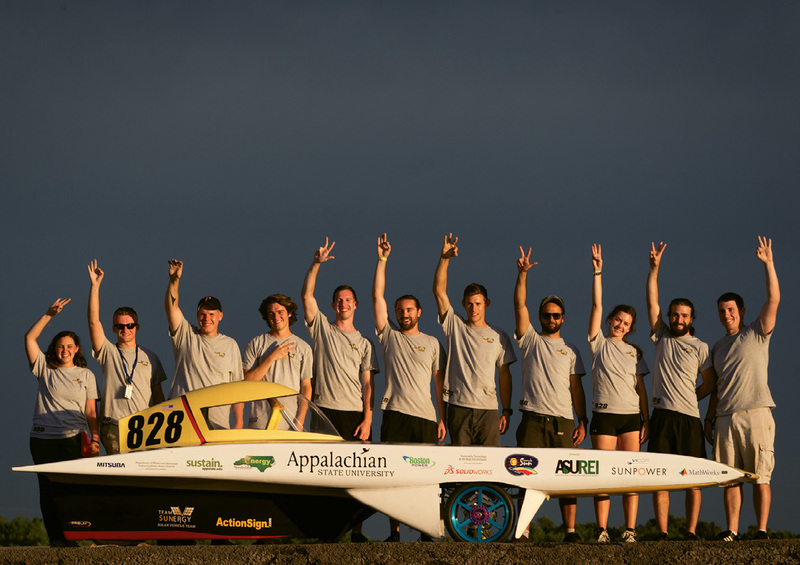 Dubbed Team Sunergy, the project began in the fall of 2014 when Jeremy Ferrell, an assistant professor of sustainable technology at ASU, was approached by Dan Blakeley, a student with an interest in solar car racing. Soon after, Team Sunergy took shape, with a roster of students from disciplines as varied as interior design, engineering, physics, and computer sciences lending their unique perspectives—all filtered through a collective interest in sustainability. With $25,000 in grant money and a donation of an old vehicle’s shell from Iowa State University, construction on the solar-powered car, christened Apperion, began in the summer of 2015. Now completed, the vehicle can reach a top speed of 70 miles per hour, but its average speed, running on solar power alone, is 45. The car does get a small boost from a lithium-ion battery: “It’s the equivalent of powering a car with the energy of a toaster oven or hair dryer,” Ferrell says. In July, Team Sunergy participated in the Formula Sun Grand Prix near Pittsburgh, Pennsylvania, competing against 14 top engineering schools, including some from Europe. It was the first time a team from North Carolina had competed in the event, and the Apperion and crew finished an impressive third place. To learn more about Team Sunergy, visit www.appstatesvt.com.